The MacBook Air’s thin, light, and portable design is good news to both on-the-go customers and those who prefer to acquire their wares using five-finger discounts. But since Apple designed the Air to be too thin to include a traditional notebook security slot, Maclocks has taken matters into its own hands. The accessory maker has announced a MacBook Air Lock and Security Case Bundle that is compatible with both the 11-inch and 13-inch models. It is essentially a case that attaches to the bottom of a MacBook Air that has a built-in security slot. 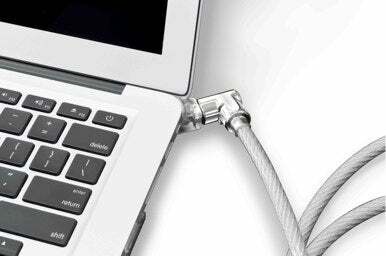 Once you attach the case to your MacBook Air and lock the security cable into its slot, a thief cannot detach the case without ruining the MacBook. Fortunately, Maclocks used a standard security slot, so it should work with just about any of the cable lock systems available on the market; a perk especially for those who already own such locks. However, for the launch of what Maclocks claims to be the first MacBook Air lock, the company has made it pretty hard not to buy its bundle of a security case and cable lock. The regular prices of a MacBook Air security case and a cable lock from Maclocks are $80 and $50, respectively ($130 total). But as a launch promo, the company is offering them bundled together for $75. Orders will start shipping on April 7.